Celebrating Ulster University’s winter graduation ceremonies 2017 at the Coleraine campus today Graduating in mental health nursing are frpm left, Stephanie Louge, Megan McKenna & Julia Best. Picture John Murphy Aurora PA. Celebrating Ulster University’s winter graduation ceremonies 2017 at the Coleraine campus today Graduating in Design at Magee are from left, Stephen Little, James Taggart & Scott Moore Picture John Murphy Aurora PA. Celebrating Ulster University’s winter graduation ceremonies 2017 at the Coleraine campus today graduating in Bio medical Science is Deborah Carey with son Donal. Picture John Murphy Aurora PA. Results and pictures from Queen's University graduation ceremony. 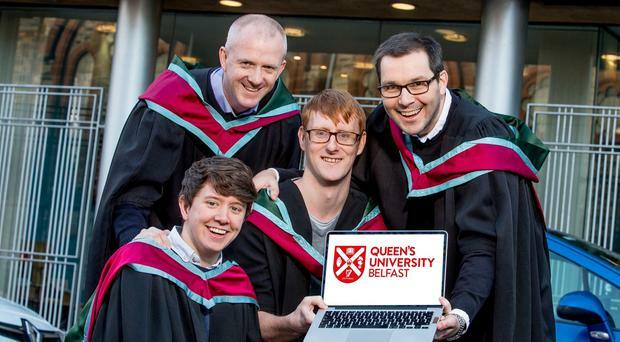 Full list of results from QUB winter graduations December 14. By Staff Reporter A leading Northern Ireland businessman will receive an honorary degree from Queen's University, Belfast today. By Adrian Rutherford A high-profile priest recognised for his contribution to peace-building and community work today receives an honorary degree from Queen's University.